My name is Chad Landman, and I’m a youth minister (pastor), independent designer, and podcaster. 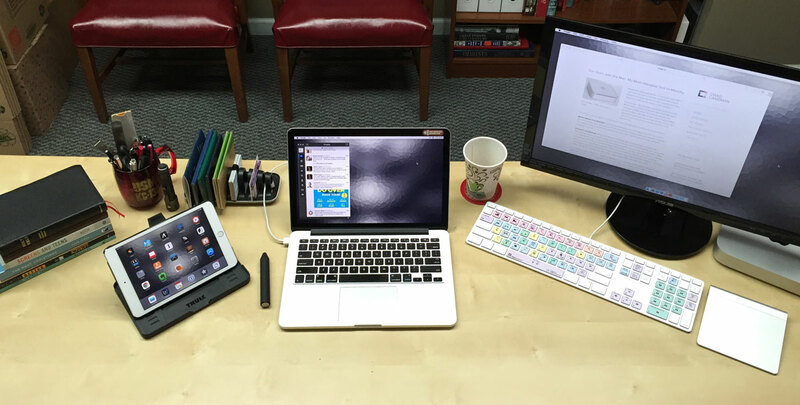 My main machine is a 2013 retina MacBook Pro (2.4 GHz i5, 8GB RAM) that I use for writing and Photoshop. 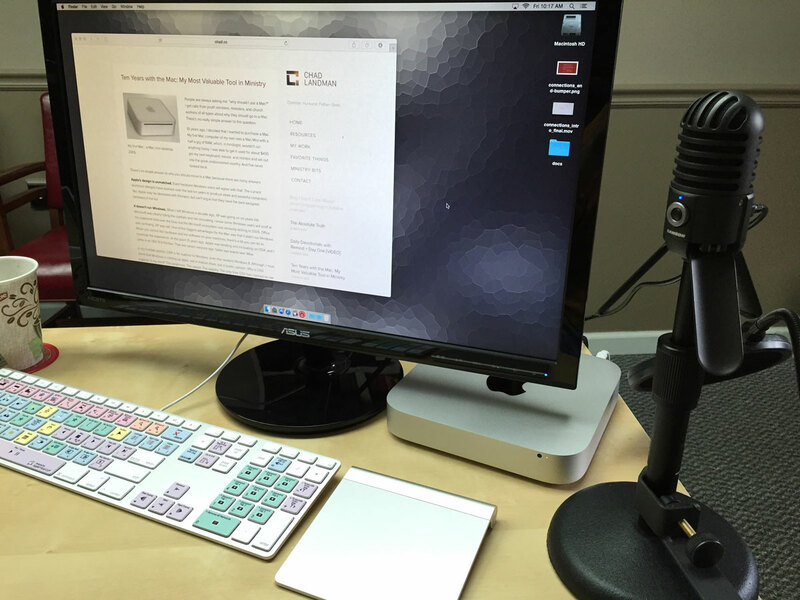 The secondary machine I use for video crunching is a late-2014 Mac mini (2.6 GHz i5, 8GB RAM) running Final Cut Pro X. It has a fast 512GB SSD which keeps things speedy. I have a Final Cut Pro Apple keyboard from LogicKeyboard that helps a lot with shortcuts for the app. I use a Magic Trackpad, which I think better allows me to move around FCPX with some speed. 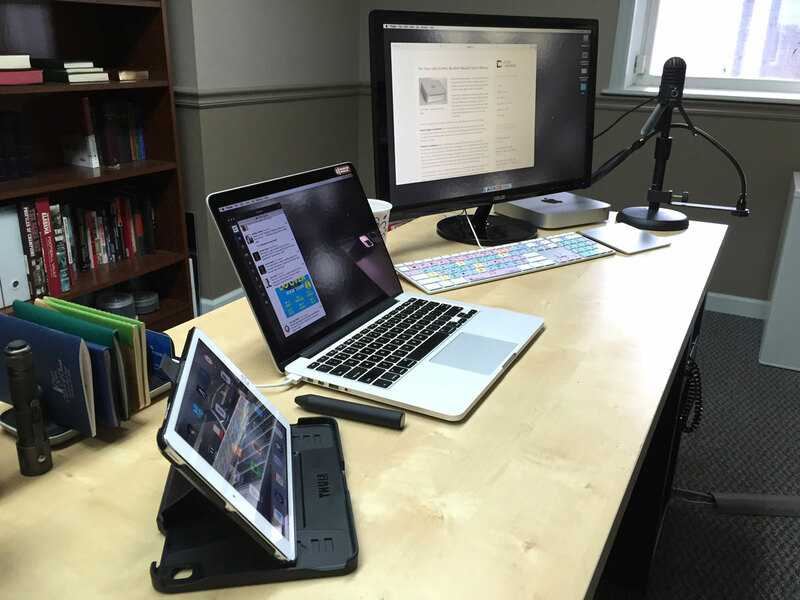 I teach and preach from an iPad mini with an app called Editorial (more on that below). My iPhone 6 is with me wherever I go. When podcasting, I use a Samson Meteor mic with a pop filter. I found my wallpaper on an excellent site called Zinx. The wallpaper’s name is Plume. I also use the same wallpaper on my iPad mini, iPhone 6, and Mac mini because I’m OCD like that. For my creative efforts, I subscribe to the Adobe CC bundle of apps and use Photoshop, Illustrator, InDesign, etc. For video, it’s Final Cut Pro X. For my ministry job, I live in plain text and Markdown. All my lessons, sermons, and even to-do lists are in plain text, Markdown, or Taskpaper. I use an app called Brackets for all of those on the desktop. It’s a great app that syncs with Dropbox and has a super-simple interface with syntax highlighting for virtually every coding langauage you can think of, including Markdown. For scheduling, I use Fantastical; for browsing, I prefer Chrome, and I use Tweetbot to manage my Twitter accounts. I run several websites, including my own, all on Squarespace through the browser. Keynote is the best presentation app I’ve ever worked with, but when I want to change things up I use Prezi. I use Adobe Audition for all my podcast editing. My ideal setup would be clean, organized, and glanceable with everything at an arm’s reach. At any one moment at work, I’m writing a lesson or blog post, listening to a podcast on my iPad mini, crunching a video on the Mac mini, and answering texts on my iPhone. The ability to use Handoff in iOS 8 and Yosemite has really upped my game. I have a grey 128 GB iPhone 6. I have two small boys, so I take a lot of pictures and videos. Editor’s note: You can find Chad’s wallpaper here. 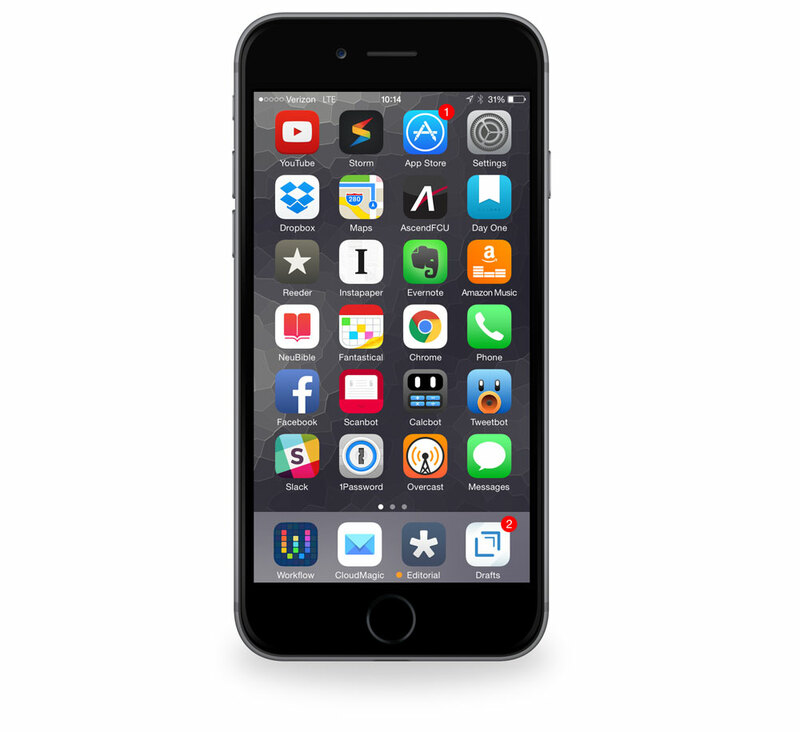 On the go – Messages, Tweetbot, and Chrome are my most-used apps. I listen to podcasts through Overcast, communicate with my teams through Slack, and keep track of all my passwords through 1Password. I love CloudMagic for email on both my phone and iPad. It has a clean and simple interface and syncs well. All my music is hosted through Amazon Music. 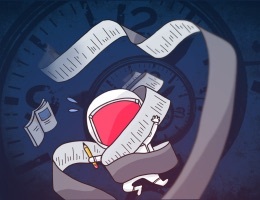 I love the speed of adding calendar appointments in Fantastical – I used to use Calendars 5 by Readdle, but have since moved to Fantastical for its speed and accuracy. Scanbot has become my go-to document scanning app because it syncs with Dropbox and has great OCR. Evernote is where I collect pictures and screenshots for projects. Drafts. I live in text. 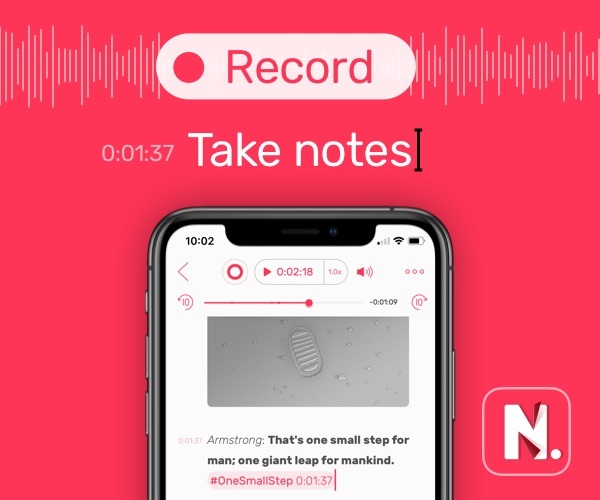 I’m always writing down reminders and bits of information that I need to remember, and Drafts helps me do it quickly and simply and lets me take that text anywhere I want to put it. I love the setting in the app that lets me badge the app to see how many items I have in my inbox. I know that if there’s a badge there then I have things I need to act on. 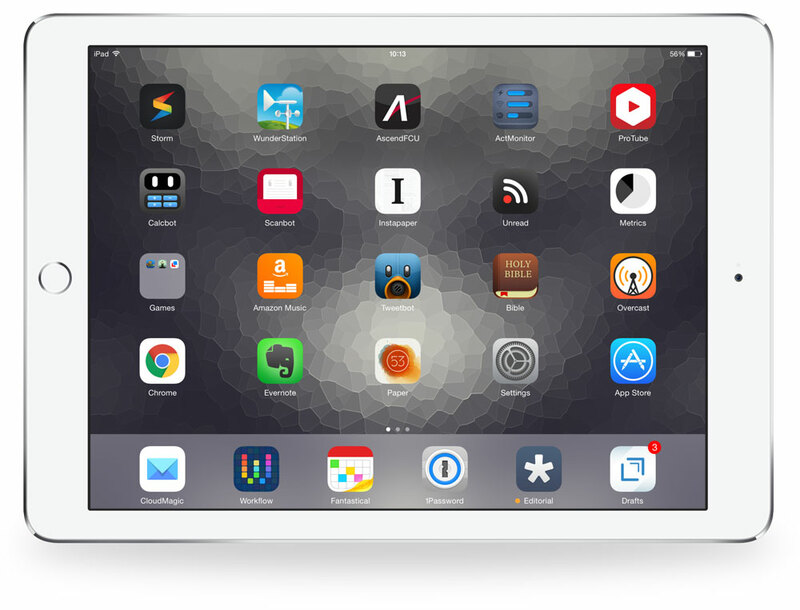 iPad mini 3 in silver, 16GB. Attached to the iPad mini is a Thule Atmos case that I simply love. I’m paperless, so everything I preach and teach is from my iPad. I also use it to play games, read my news feeds, watch videos, and surf websites. I view my calendar a lot on phone calls through Fantastical on my iPad mini. I’ll read articles every morning using Unread and Instapaper. Tweetbot hasn’t yet updated their wonderful app for iOS 7/8 yet (wink wink, nudge nudge Tapbots), but I still find it’s a great app for Twitter despite looking very much like iOS 6. Scanbot is a great scanning and OCR app I use to scan documents and sync them to Dropbox. I find myself going more and more to YouTube to watch videos from tech people I like, other churches sermons, and how-to videos to fix stuff in our new home, so I love the ProTube app from Jonas Gessner. I’m a weather nerd, so Weather Underground’s new Storm app for checking the weather is great, and their WunderStation app displays weather data in the best way I’ve ever seen. We can get some pretty bananas weather here in middle Tennessee. I love using Paper by 53 to sketch and draw layout concepts. I use my Cosmonaut stylus for that. Since I only have 16GB of storage, Activity Monitor (no relation to the built-in Mac app) is great for keeping track of exactly how much space I have left. Editorial. It’s the one-stop shop for everything I do. I’ll write most lessons and sermons out on my Macbook Pro and sync them via Dropbox through Editorial, to which I can then display my lessons in wonderful, clean format for viewing while I’m teaching. Unlike most ministers or teachers who use outlines or bullet points, I write my lessons out word-for-word. This takes more time, but also helps me avoid confusion later on. In my opinon, Editorial’s most powerful feature is searching — not just file names, but all the text in any of the text files in my Dropbox folder. This is incredibly useful when I’m trying to reference something I’ve written or one of the resources I’ve collected.